No Incinerator 4 Horsham, CPRE Sussex and many others have joined the South East Climate Alliance – a coalition of local environmental groups across South East England uniting for urgent action on climate change, which is needed at every level if we are to get on top of the climate crisis – from individual actions and changes in business practices to national and local policy and global agreements. We are calling on all our Local Councils to declare a Climate Emergency. 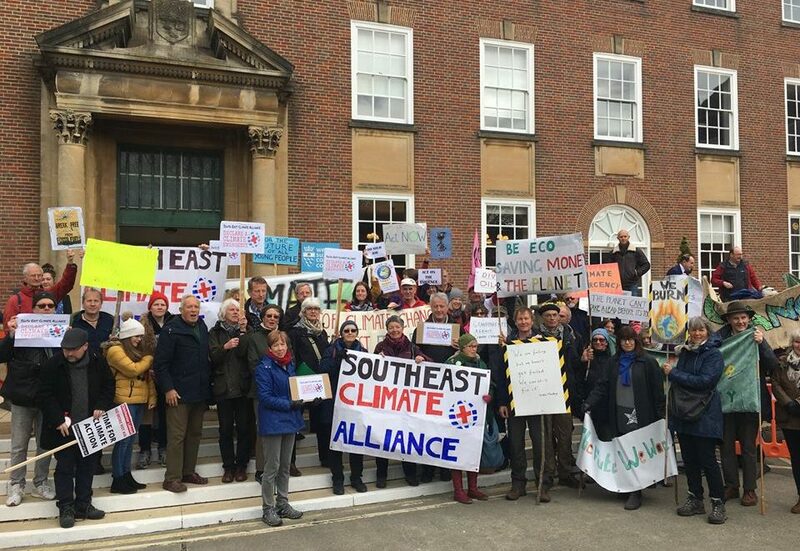 Congratulations and thanks to everyone who came along to Chichester on 5th April 2019, and who lobbied their County Council members to back the climate emergency motion. It worked! Though many of us were disappointed that the original motion was amended, and the climate emergency was ‘noted’ rather than ‘declared’, the Council took a big step. It looks like WSCC is serious about getting its act together on climate change. The consensus across the chamber was the most encouraging part. Read SECA’s press release for more information. Keighley MP John Grogan has managed to secure a backbench debate on “the regulation of the incineration of waste” – currently scheduled for 11am on Tuesday 9th April in Westminster Hall. This debate provides an opportunity for your MP to listen to the range of arguments against incineration being formally raised in Parliament, and John Grogan has kindly indicated that he is prepared to take ‘interventions’ – meaning that your MP can potentially add their voice to those of other MP who are sceptical of waste incineration. Please contact your MP today to let them know about this opportunity, by writing to your MP and/or by telephoning your MP’s constituency office. Please help Ni4H raise £50,000 for technical expert reports and a barrister at the Public Inquiry. Thanks for donations and pledges already received, we have raised 6.75% of our target so far. Donate by cheque: please contact us for details.